Facebook Campaign Management for Huawei – a leading global ICT solutions provider. The contest was part of promotional efforts during the launch of their new smartphone and smartwatch. 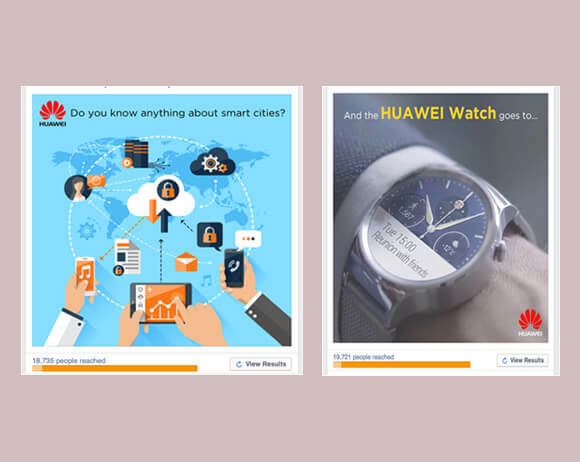 Our Facebook Campaign Management efforts focussed on building awareness about 2 new products that Huawei had just launched in the Indian market – a smartphone and a smartwatch. The contest also aimed to inform people of Huawei’s enterprise solutions. The effort was planned as a 2-week long Facebook campaign that aimed to secure more likes for the brand’s page. The target of the campaign was to secure at least 500 likes. Crafting Genius ran an extremely successful Facebook campaign that included a Facebook contest – earning the page 3000 likes, using only 60 percent of the allocated budget. We also made sure that all the winners of the contest received their prizes as promised.